View of building, corner of 18th Street and Marine Drive. 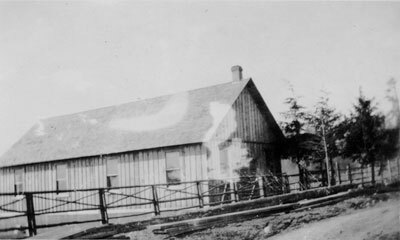 Building was used as first Presbyterian Church in West Vancouver as as Hollyburn School. Building was constructed in 1910.Original WVML cataloging note:Originally the building consisted of a wooden platform with canvas side - however some time after it was built a storm damaged the canvas portion of the building and it was replaced by wooden siding, as shown in this photograph. The building was subsequently moved to the corner of 21st and Marine Drive, site of the present West Vancouver united Church, where it became part of the church complex. Scanned August 2011 using Epson Perfection V700 Photo at 600dpi and 100% of original image size. Alternate Versions: Lossless TIF from original scan at 600dpi and 100% of original slide. W10 x H6 cm black & white print on photo paper.